Animonda GranCarno Original Adult Meat Mix is tasty wet food with fresh pieces of meat for adult dogs. The wet food is enriched with meat from beef, chicken, turkey and game. GranCarno Original Adult Meat Mix from Animonda is delicious and healthy wet food for your adult dog. The food is made of 100% fresh ingredients and is enriched with visible pieces of meat from beef, chicken, turkey and game. The meat mix does not contain any grains and no soy. 52% beef meat (liver, lung, meat, kidney, heart, udder), 8% chicken (heart), 5% turkey (heart), 4% game (meat) and calcium carbonate. 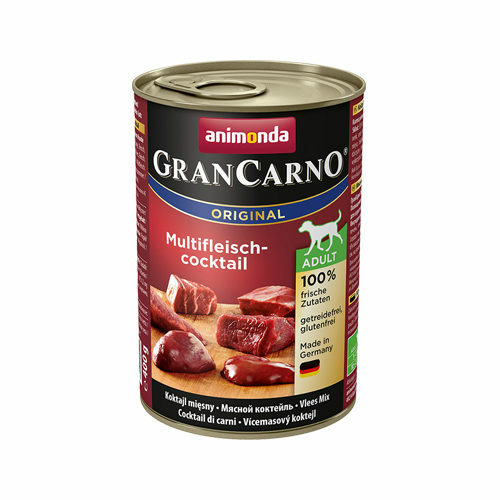 Have you used Animonda GranCarno Original Adult Meat Mix before? Let us know what you think about this product.